Many spiritual parents consecrate their children to God for His divine love and service. Among the Jews of Mary’s time, many offered their children to God by the hands of the priests in the Temple, to be brought up in quarters attached to the Temple. They would attend to the priests and Levites in their sacred ministry. They had special divisions in these lodgings for the women and children dedicated to the divine service. Today the Church celebrates the feast of the Presentation of the Blessed Virgin Mary in the Temple of Jerusalem. 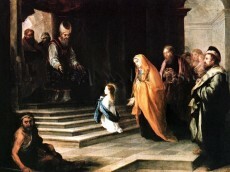 It is most likely that the holy prophet Simeon and the prophetess Anna, witnessed the Presentation of Jesus in the Temple as we read in the second chapter of the Gospel of St. Luke, verse 25, “Had known His Mother as a little girl in the Temple and observed her truly unique sanctity”. It is an ancient tradition that the Blessed Virgin was solemnly offered in the Temple of God at the age of three by her parents St. Anne and St. Joachim. The Gospel tells nothing of Mary’s childhood, her title “Mother of God” eclipses all the rest. Twelve years of recollection, prayer, contemplation, suffering, were great preparations for Mary’s mission. The Father looked upon Her as HIS beloved daughter, the Son as one set apart and prepared to become HIS mother, and the Holy Ghost as HIS undefiled spouse. According to St. Jerome, we have a view into a day of Mary’s life in the Temple. From dawn until 9am, she prayed. From 9am – 3pm she did manual work. She then returned to prayer, and was always the first to take night watches. She was the one most applied to study, the purest among virgins, and the most perfect in the practice of every virtue. It is on this day that the Church honors Mary as the standard for Christian virginity. After Mary, came countless numbers of women who consecrated themselves to the Lord, and engaged in the charitable works of the Church throughout the world. Mary will be their eternal model, their dedicated Patroness, and their sure guide on the path to perfection. Today is a great time for us to honor Mary for the many sacrifices she made for us, even at an early age, to prepare for her mission as the Mother of God.